I'm actually writing this post on Saturday, the 18th and scheduling it to publish on the 22nd, and if all goes as planned then, today, the 22nd, I'm on an airplane heading to Toronto, then driving to my hometown of Kingston, Ontario to spend Christmas with my Mom. I've become used to the moderate winters in Denver, so I hope that it's not too cold when I get to Canada. I've packed warm sweaters, and of course, my winter coat. Every month I look forward to an internet "TV" show called Live From Daryl's House, a product from Daryl Hall. 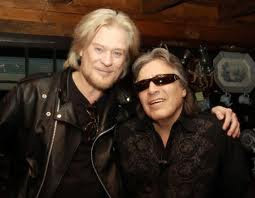 Do you remember Daryl Hall and John Oates? A new episode is broadcast, beginning on the 15th of each month. He invites a singer, or a band, to his country house where one of the buildings is set up for music, and food. Up until now, my favorite past episode was when he had Smokey Robinson as a guest. Do yourself a favor and check out this month's show with Jose Feliciano. The music, especially the Christmas music, is wonderful. So is the guitar-playing. Sit back, knit, enjoy!